Humans love pushing themselves to the limit, even if it means literally setting their insides on fire. Yes, we’re referring to masochistic people who continue to consume hell in food form, aka ghost peppers. Most recently, Kevin Strahle broke the world record for eating the most ghost peppers in two minutes and survived the orifice destroying challenge. 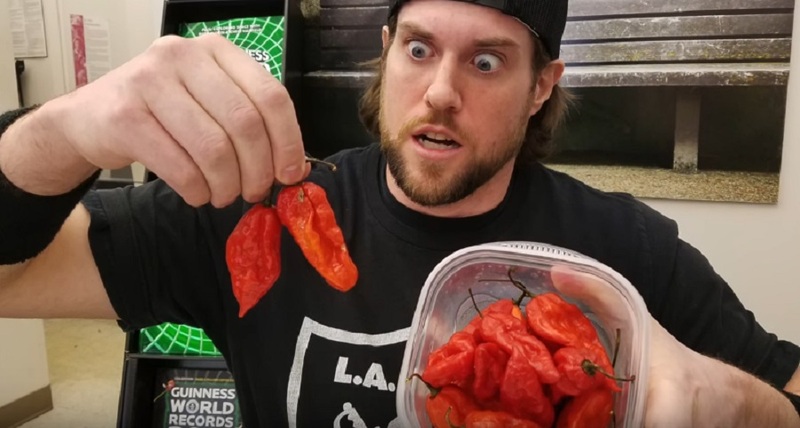 Strahle (also known as LA Beast) showed off his incomparable ability to eat several incredibly hot bhut jolokia ghost peppers, because that’s just a day in the life of a professional competitive eater. We know what happens when you accidentally swallow a ghost pepper (Hint: It’s not pretty), but what about when you voluntarily shovel them into your mouth like pint-sized snacks? After his mouth heals from this pepper-induced bruisin’, maybe Strahle can describe what he went through while trying to break this world record, but for now, there’s video of his attempt that shows precisely how brutal this mouth-mangling challenge can get. According to the challenge narrator, the ghost pepper is about 400 times hotter than Tabasco sauce, which leads us to ask for the millionth time, WHYYY do people bother eating these damn things? Who knows, but Strahle was really into his, er, craft. In fact, he was so serious about breaking the previous world record of 66 grams of ghost peppers eaten in two minutes that he practiced for a month and a half by chewing on dried ghost peppers. A beast, indeed. In the end, Strahle surpassed the old record by consuming nearly twice the amount in the same time. With the exception of an extremely reddened face and a few grunts, we’d say he handled these ghost peppers like a pro. Although this fiery food feat was undeniably impressive, we’ll still gladly stay as far away from these peppers as possible.